Inside The Market: The local banks : Banca Popolare di Sondrio and Credito Valtellinese. The local banks : Banca Popolare di Sondrio and Credito Valtellinese. Throughout history, CVAL and BPSO have been the subject of more comparisons because of geographical proximity, the similarity of the business and other aspects. It has spoken repeatedly of a possible marriage between the two banks (http://www.ilgiorno.it/sondrio/cronaca/2012/11/12/800989-Fusione-Credito-Valtellinese-Banca-Popolare.shtml ; https://www.investireoggi.it/finanza-borsa/bper-creval-popolare-sondrio-ipotesi-fusioni-due-scenari-possibili/ ; http://www.milanofinanza.it/news/creval-pop-di-sondrio-mercato-scommette-su-fusione-201406021112394411), due to the strong similarity. However, in my opinion, in the M&A sector, the most important thing is to create adding value and synergies. If you match together two equal businesses, you don't generate synergies. The result of the merger is only the same firm but greater : that is not a complementary business but a substitute. Of course, the common aspects can be used for a major geographical control and for the lower competition, in this way. Nevertheless, in the long-run, you need to grow/to acquire new markets and customer segments, you need to implement new services. By focusing only on geographical matter and/or on the classical commercial bank, you will not reach those goals, most likely. Nowadays, the market is changing, costantly. We must be able to meet the challenges and we have to be more flexible : the banking sector (like the past) is dead ; the new banking sector is integrated, inevitably. About the latest news, the hypotheses seem to be oriented more to BPER and UNIPOL, after the press relase http://www.gruppocreval.com/media/comunicati_en/CV-CS-Nomina-Advisor-ENG.pdf. See the link below : http://www.milanofinanza.it/news/equita-in-caso-di-fusione-con-bper-il-premio-va-al-creval-201701231129545256. Because of the above reasons, I would consider these options more positively. The direct (+4.76%) and indirect (+0.61%) funding grows where for CVAL, we have a decrease, -2.7% and -4%, compared to the same period. The same, with regard to loans and receivables with customers (-8.5% vs +5.49%). The capital ratios are equal, substantially : CVAL, CET1 11.8% vs 11.09% (BPSO) and Total Capital Ratio 13% vs 13.58% (BPSO). About the organisational data, there is an improvement for Banca Popolare di Sondrio : 128 new hires and 5 new branches. Credito Valtellinese got worse : number of employees (-1.65%) and number of branches (-4.37%). 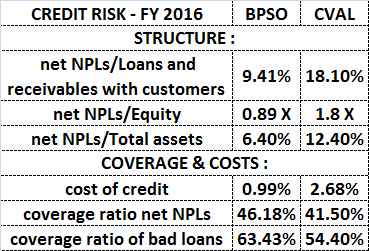 With regard to the credit risk, the credit quality of BPSO is better, of course. The following table shows the comparison. BPSO has far fewer NPLs and it has higher coverage. The coverage ratio expresses a prudent policy of the bank and a lower potential risk, the higher the coefficient. The cost of the policy is better than CVAL. Finally, about other financial information, the cost to income ratio shows the better operating efficiency of BPSO, 55.31% vs 69.7% (CVAL). Speaking about the income margins, for both, there is a drop in margins, thanks also to an unfavorable macroeconomic context. However, for BPSO, the decrease is balanced by a cost savings, like administrative (+2.53%) and personnel expenses (+0.44%) vs CVAL, +4.22% and +17.34%. Secondly, there are minor net adjustments for BPSO. Overall, clearly, at the end of the comparison, BPSO is the favorite. On the other hand, we should not forget the M&A factor that could change the scenario (market price and business) for CVAL, positively. In fact, CVAL is well set to grow by external lines (like announced) while BPSO seems to continue through the autonomous growth.